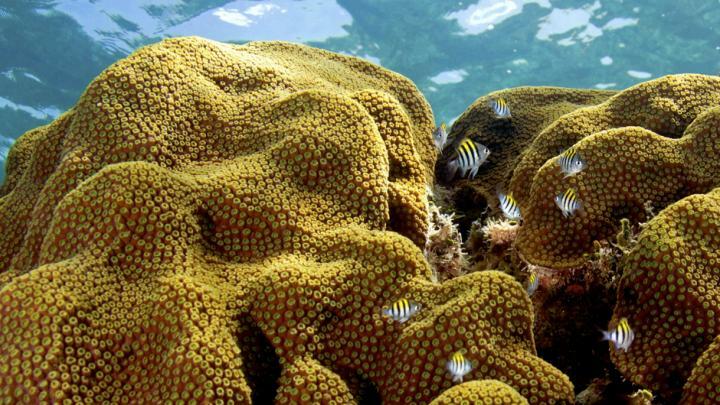 MIAMI–New research shows that not all corals respond the same to changes in climate. The University of Miami (UM) Rosenstiel School of Marine and Atmospheric Science-led study looked at the sensitivity of two types of corals found in Florida and the Caribbean and found that one of them–mountainous star coral–possesses an adaptation that allows it to survive under high temperatures and acidity conditions. "Stressful periods of high temperature and increasingly acidic conditions are becoming more frequent and longer lasting in Florida waters," said Chris Langdon, marine biology and ecology professor and lead author on the new study. "However, we found that not all coral species are equally sensitive to climate change and there's hope that some species that seemed doomed may yet develop adaptations that will allow them to survive as well." The researchers exposed two threatened Caribbean reef-building coral species, staghorn coral (Acropora cervicornis) and mountainous star coral (Orbicella faveolata), were exposed to combinations of normal (26 degrees Celsius) and elevated temperature (32 degrees Celsius) and increased carbon dioxide levels (pH 7.8/800 ppm) for nine weeks. Genetic and physiological data such as skeletal growth was then collected on the corals to determine if stress events are recorded in a coral's skeletal history. At the end of the nine weeks any corals that were still surviving were recovered at the cool temperature and normal pH to determine the capacity of these corals to bounce back once environmental conditions became more hospitable as naturally occurs as summer transitions into fall. The researchers found that the staghorn coral was more sensitive to heat stress. It experienced 100 percent mortality after 25 days at the elevated temperature of 1.5 degrees Celsius above the historical maximum monthly mean temperature for the Florida Keys. South Florida waters could begin to experience hot spells of this intensity and duration once every five years by 2035, which according to the researchers suggests that the species could become increasingly rare within 20 years. The mountainous star coral survived 62 days at the elevated temperature and quickly recovered when temperature was reduced at the end of the experiment. Reduced pH did not affect survival but did significantly impact growth under normal temperatures. "Based on these results we predict that mountainous star coral will very conservatively be able to tolerate any warming the Florida Keys is likely to experience now until 2060 and very possibly to the end of the century," said Langdon. "This optimistic prediction needs to be qualified by the fact that decreasing pH will impact the reproductive potential of this species. While the decreasing pH won't kill the corals outright it will mean that fewer baby corals will be produced to replace adult corals that die of natural or unnatural causes." Coral reefs are especially vulnerable to climate change because they are easily affected by warm water. When ocean temperatures rise, the algae that give coral its bright colors leave their host, causing it to look white, a condition known as 'coral bleaching'. The loss of algae, which provide coral with much of its energy, make corals vulnerable to starvation and disease. The mountainous star coral had special algae, called D symbionts, which the researchers believe made it able to adapt to the experimental climate change conditions. Rapidly warming oceans are resulting in more frequent and severe mass bleaching events, while the uptake of CO2 by the surface ocean is driving down the pH making it more difficult for corals and other organisms to build their skeleton and shells. The study allows researchers to better understand how corals respond to heat stress and ocean acidification, which is important since these conditions are expected to affect corals in coming decades and to understand how these stressors are recorded in coral skeletons. The study, titled "Two threatened Caribbean coral species have contrasting responses to combined temperature and acidification stress," was published on July 31, 2018 in the journal Limnology and Oceanography, DOI: 10.1002/Ino.10952. The study's coauthors include: Chris Langdon and Andrew C. Baker from the UM Rosenstiel School of Marine and Atmospheric Science; Rebecca Albright from the California Academy of Sciences; and Paul Jones of the UM Rosenstiel School-based NOAA Cooperative Institute for Marine and Atmospheric Studies (CIMAS). Support for the study was provided by the National Science Foundation (grant # OCE-0547169). The University of Miami is one of the largest private research institutions in the southeastern United States. The University's mission is to provide quality education, attract and retain outstanding students, support the faculty and their research, and build an endowment for University initiatives. Founded in the 1940's, the Rosenstiel School of Marine & Atmospheric Science has grown into one of the world's premier marine and atmospheric research institutions. Offering dynamic interdisciplinary academics, the Rosenstiel School is dedicated to helping communities to better understand the planet, participating in the establishment of environmental policies, and aiding in the improvement of society and quality of life. For more information, visit: http://www.rsmas.miami.edu.